Quebec-based developer Empty Clip Studios made an appearance at PAX Prime this week to show off their latest project, Symphony Worlds. Symphony Worlds, the sequel to Symphony, is an abstract, highly visual game that uses music to procedurally generate unique gameplay. What makes Symphony Worlds particularly special is the way that each level is made. Users select their favorite songs, and then the game creates a custom-made planetary body that adapts to the specific qualities of that music. A grunge song may generate a world with very harsh terrain, where spikes of rock jut out menacingly from the ground, and large looming canyons close in around you. In the same fashion, an upbeat pop song from the Flight of the Concords soundtrack may create a serene planet with placid lakes and happy little islands. What's more, the mechanics of each level and the strategy necessary to finish it will also vary from song to song. While song selection will likely be limited when the game is released, the developers intend to ultimately allow users to upload any song they want. As far as mechanics, Symphony Worlds seems to be equal portions of action and base building. Once the world has been made, the user pilots a small spacecraft in third person, flying around the planet and working to fight off a competing melody. While you travel around, you'll harvest resources and destroy the enemy's amplifiers, which silences their music and establishes your own as the dominant force. At this time, there is no multiplayer mode, but the studio hopes to implement one sometime after launch. The only apparent drawback to Symphony Worlds is that at times the game can be a little visually overwhelming, which could either lead you to "joypuke" or just regular puke depending on your personal taste. As the game increases in its complexity, bright shapes fly across the screen in every direction, making it difficult to know where to look. Instead of making sense of that chaos, the user interface feels somehow both sparse and cluttered at once. The various bars and meters tend to be spread out across the screen, with cascading walls of small text that scroll across the user's line of sight. These flaws will likely be refined before Symphony Worlds' final launch however, and should probably be forgiven considering that the game has been built by a miniscule three person studio over the course of just over a year. Ultimately, despite its slightly awkward implementation, the unique and variable way that Symphony Worlds creates content feels like a breath of fresh air, alluding to an exciting future for the entire world of video games. If physical and strategic aspects of gameplay can be spontaneously created in response to something as unrelated as music, it's exciting to imagine the strange and interesting ways that other games could also be made. 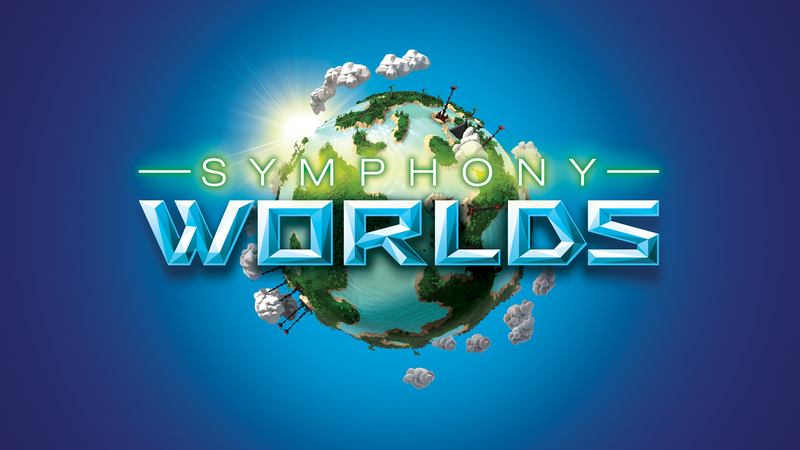 Symphony Worlds is planned to launch in 2016 on Steam.